Pyroban has recently converted a Toyota 8FBMHT70 with a 7 tonne lift capacity for use in a Zone 1 area at a petrochemical site in the UK. 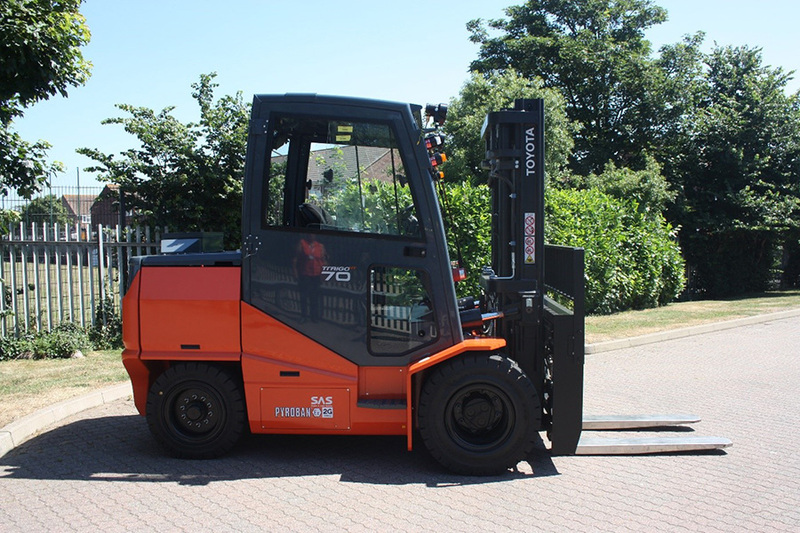 This is an unusual combination, so we checked our records and believe that it is the first Zone 1 lift truck with this capacity to be converted by Pyroban. Most explosion protection lift truck conversions by Pyroban are for trucks with a lift capacity of 1 to 3.5 tonnes. Furthermore, most conversions are for use in Zone 2 hazardous areas, where users are interested in alerting their drivers and management to the presence of a potentially dangerous mix of gas or vapour in the atmosphere. A Zone 1 area is classified as somewhere that an explosive atmosphere, where the air may be mixed with flammable substances in the form of gas, vapour or mist, is likely to occur sometimes in the course of normal operation. Usually, Zone 1 classified areas are found in process operations where it is more probable that gases will be present. Explosion protected forklifts are needed to operate in these areas to reduce the risk of ignition. For more information on materials handling conversions for ATEX classified areas including Zone 1, contact us.